James Todd Burns, 62, of Blue Eye, MO, formerly of Topeka, died at 7:20 p.m., Sunday, July 9, 2006 at Table Rock Health Care in Kimberling City, MO. 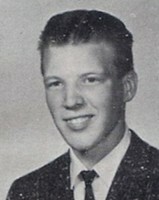 Todd was born on July 1, 1944 in Topeka, the son of Charles and Betty McDaniel Burns. He was an U.S. Air Force Veteran after serving his country for 22 years and served in Vietnam. He also retired as Chief Security with the Maximum Juvenile Prisons for the State of Kansas. He moved to Blue Eye in 2000 from Kansas. He was a member of the United Methodist Church in Kimberling City, MO. Survivors are his wife, Carol J. Werner Molt Burns of the home; two children, Deedee Balukas of Holly Springs, NC and Tim Burns of Ozawkie, KS; three step-children, Jana Meyers of Overland Park, KS, Jeffry Molt of Prairie Village, KS, and Russell Molt of Overland Park, KS; two brothers, Ken Burns of Topeka, KS and Ron Burns of Canton, OH; one sister, Karen McCrory of Denison, KS; seven grandchildren and two great-grandchildren. Funeral Services for Mr. Burns will be at 11:00 a.m., Friday, July 14, 2006 at Penwell-Gabel Mid Town Chapel, 1321 S.W. 10th Avenue. Burial will follow at Mount Hope Cemetery. He will lie in state after 11:00 a.m. today at the funeral home where the family will receive friends from 1:00 to 3:00 p.m. Memorial contributions may be given to the American Cancer Society, 1315 SW Arrowhead Rd., Topeka, KS 66604.